This gentleman had had extensive gum disease and swelling. This required the removal of the four of the upper front teeth and surgery to the gum of adjacent teeth. Following a period of healing it was possible to place two dental implants which were used to carry a bridge of four teeth. 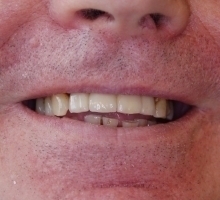 The patient initially had a temporary bridge whilst the implants healed into place before the final bridge was placed at around 3 weeks later.